Rapid redhead Mel Pocock (REVO Husqvarna UK) grabbed the series lead in the hotly-contested EMX250 class at Agueda in Portugal over the weekend. 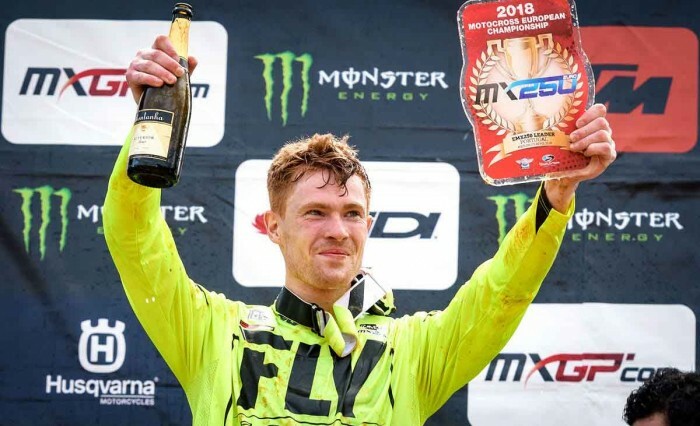 The 25-year-old British rider, third in points after the opening round, started Saturday’s moto battling for the lead with Kiwi Dylan Walsh (Husqvarna) before France’s Mathys Boisrame (Honda) swept past the pair into the lead. In the closing stages Mikkel Haarup got in on the act too with the Dane pushing through into second. Pocock – who won the title back in 2012 – finally got the better of Walsh for third but then lost a position with three laps to go to Estonian Karel Kutsar (KTM). Still, with the French pairing of Pierre Goupillon (Kawasaki) and Tom Vialle (Husqvarna) – first and second at the opening round – well down the order, the Brit found himself as series leader. With track conditions extremely challenging, Pocock briefly led the second 25-minute plus two lap race on Sunday morning before Boisrame hit the front followed by Norwegian Kevin Horgmo (KTM) and the top three looked set until the Brit slipped off the final lap, surrendering third to chasing Frenchman Brian Moreau (Kawasaki). Consistency in the conditions was key and Pocock’s pair of fourth-placed finishes was comfortably good enough for second overall behind the dominant Boisrame and an eight-point championship lead. Pocock’s 30-year-old team-mate Martin Barr headed into Portugal carrying ligament damage in his thumb sustained a fortnight earlier at the British championship opener. Despite this he ran as high as fifth in the opening moto but inevitably faded back to ninth as he struggled to hold onto his bike on the numerous descents. The man from Northern Ireland is notoriously tough and determined and he started race two in fourth but crashed on an uphill section and completed the first lap in 16th before carving his way back up to seventh by the end. The result helps him to retain fourth in the championship and with nine rounds – and 18 races – to go is just 11 points off the lead. Of the other Brits in action, a 15th in the opening moto earned Josh Spinks (M Smith KTM) six points from the weekend but former champion Steven Clarke (Carglass Honda) came away with just two points for a 19th in race one and Todd Kellett (Verde Substance KTM) failed to score.